Katharine Wolfe suggests that recognizing the interdependent aspects of a mother and a child’s welfare may help to change how home birth is viewed. When I mention to others that the freedom of a mother to give birth at home in Nova Scotia is restricted, and potentially criminally punishable, many respond with shock and surprise. The visceral effect of this information, about another way in which reproductive autonomy is curtailed in Canada, is often powerful. The moment reveals how unaware many are of such limitations as well as their troubling impact. Section 242 of the Criminal Code of Canada stipulates that anyone who “fails to make provision for reasonable assistance” in the delivery of a child may be held criminally liable for child neglect, and imprisoned for up to five years. Yet try as one might to secure assistance for the birth of a child at home, other legal restrictions in Nova Scotia make it nearly impossible for many to succeed. Up until September 23rd 2013, provincially employed midwives were authorized to attend home births in the South Shore area only. Now, home birth is publically supported in the Halifax Regional Municipality (HRM) as well, but only for those able to obtain midwifery care – and demand greatly exceeds supply. Even for those who would be able to pay for the services of a private midwife, the option remains off the table. Since the Midwifery Act came into effect in Nova Scotia in 2009, midwives who wish to practice privately in the province must have liability insurance. The cost is reported to be prohibitively high. These are but a few features of the current situation facing those who want to give birth at home in Nova Scotia. This situation calls for political redress. Yet effecting political change may require shifting an individualistic ethical framework informing attitudes towards home birth in the province. This underlying ethical scaffolding may partially explain why giving birth at home is currently a potentially criminal act, and why the option of home birth has been so slowly, and so very partially, introduced into the public health care system in Nova Scotia. Sue Sherwin has written of the importance of rethinking ethical frameworks here. For example, in response to news stories (e.g., here and here) about the renewed option to have a midwife-assisted home birth in HRM, commentators have described the choice to give birth at home as “selfish” and indicative of a mother valuing her birth experience over the child’s welfare. A recent publication in Maclean’s magazine lends fuel to this view by highlighting the possibility that benefits to the mother from home birth are bought at the expense of the child. Elizabeth Bogdan-Lovis and Raymond De Vries have found similar trends elsewhere. A careful study of the current data on the safety of home birth for both mothers and children is called for in response to these criticisms. But, so too, is some thoughtful attention to the terms in which this conversation is taking place. Why it is that the interests of mother and child are being pitted against each other, and what does this dichotomous ethical purview leave out of the story? Both mother and child are treated here as independent beings whose welfare can be cleanly weighed and balanced on opposite ends of a scale. But are they so independent, and can their interests be so divided? While mothers can experience their own interests as differing from those of a child during pregnancy, in many instances and in multiple respects, mothers also often experience their own welfare as hinging on that of the child. In such instances, both present and prospective harms to the child are often lived as present or prospective harms to the mother. Grounding ethics in issues of individual rights and isolated welfare renders such interdependent aspects of a mother’s welfare invisible and inconsequential. In turn, the child’s welfare is also starkly dependent on that of the mother. The child is nourished by the mother’s nourishment and affected by the medications that affect her. Further, the mother’s psychological and emotional relationship to the event of birth can influence the course of the labor, either facilitating the physiological processes of birth or inhibiting them, and, in turn, affecting the child. The kind of birth experience a mother has also often affects her ability to breastfeed afterwards, her susceptibility to post-partum depression, and her bond with her child. Given such far-reaching forms of mutual dependency, any ethical assessment of a mother’s actions at the time of birth that begins with a stark dichotomy between the mother’s interests and the child’s interests will be sorely wanting in missing some of the most profound needs of both, not only during birth but afterwards. Katharine Wolfe is a Teaching Fellow at the University of King’s College. The homebirth mafia ignores the interests of the baby. A statement that will be met with approval by many. Many people assume, quite uncritically that the interests of the child are always best served in a hospital. ‘The birth is for the child a matter of vital importance and the mother must sacrifice herself ‘ is a widely shared sentiment. In practice I see this happen every day. Mothers, in my experience, go to great lengths to protect their child, in order to give their child the best start. Safety is paramount for everyone. The problem is that no good definition of safe birth exists. In recent decades we have developed a hugely mechanistic vision of obstetrics. The technique makes this possible. Were once mother and child an inseparable dyad, nowadays this is no longer so. Ultrasound made it possible to view the baby as a separate entity. The mother is the casing, perhaps the not very safe container in which the child floats. We can keep an eye on that child and if necessary rescue it from that environment. But the mother is obviously not a numb container. She is a woman of flesh and blood, who is about to give birth to a new human being of flesh and blood. A new human being in whose well being she will invest intensely the next twenty years. More than anyone else. Whose welfare is of the greatest concern to her. And for whom she will often put herself in a second place. To give her baby a good safe start a mother will start looking for a safe place to give birth. Birthing is a parasympathetic process. A woman needs a quiet space and trust, surrounded by loving, kind people who assist and encourage her. The confidence of women in their ability to give birth has been systematically undermined for years. The contemporary perception is: a birth is a process that is preceded by a dangerous disease, namely pregnancy, and that birth may be brought to a successful conclusion thanks to ample use of technology and analgesia. Health care is our largest industry and growing still. Pregnant women come here to choose from the alternatives offered by the industry in this market. And each product has the label ‘SAFE’ glued over the price tag. But the emotional side, let alone the costs involved are not mentioned here. There is ample evidence available that continuous presence of a friendly woman during labor can help a smooth progress. Still, no insurance company covers doula care during labor. Even if you have a 4 star package. Epidurals are reimbursed without a question. However, an epidural has the disadvantage that the possibility of an instrumental delivery increases. Is that safe for a baby? A child that can be pulled out of its mothers body can usually be born normally. An avoidable caesarean section poses risks for mother and child, it is major abdominal surgery, but also a subsequent pregnancy and childbirth are riskier because the uterus has a scar. Women who give birth in an environment where they do not feel heard, who are anxious, have a greater chance of developing post-traumatic stress disorder. They cannot enjoy their baby, the environment in which the baby grows up is less safe than the mother would want. Can we blame women if they want to influence the circumstances of their birth? Almost every intervention in the name of the safety of the child is invading her body. Women looking for safety weigh other risk factors than professionals such as midwives and ob/gyns. Is a mother wrong when her risk perception differs from theirs ? Is a professional always right? 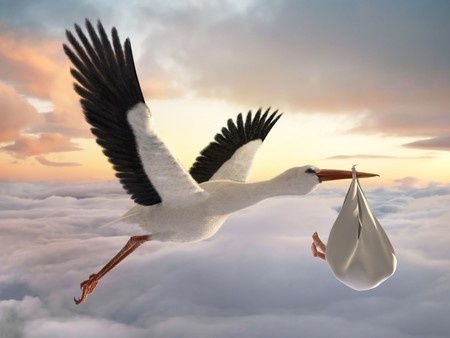 Isn’t it remarkable that new parents can take more risks with their newborn babies than they could with the child that was still in its mothers womb only hours before? Consider not breastfeeding as a choice. Think of not vaccinating as choice. Giving birth can for a woman mean a very positive experience, an experience that adds something to her life. Where a woman grows, where her family benefits, where society at large benefits. But women are so frightened these days and so convinced that a good birth is not within their reach that a good birth is not considered a realistic goal. To survive he birth as undamaged as possible is the goal. With an epidural it is possible to tolerate whatever is done to your body in the name of safety. This feeling of insecurity will hinder a good birth and thus increase the risk of interventions which potentially can mean a less safe situation for the baby. The choice mothers made for homebirth with a midwife they felt they could trust, has nothing to do with selfishness of these mothers but all with an urgent sense to make baby’s entrance in this world as safe as possible. ← Electronic Cigarettes: Should We “Tar” Them With Same Brush As Regular Cigarettes?